If you're looking for a backyard setup for the 11-inch softball player in your family, you'll never find a more affordable package deal than this one. It pairs Heater Sports' PowerAlley 11-inch softball pitching machine with a 22 foot PowerAlley batting cage. Whether you play in a slow pitch league or play fast pitch softball, the PowerAlley 11 inch softball pitching machine can help you improve your hitting immensely. It features variable speed control, allowing you to adjust pitch speeds from 15 to 40 MPH. While that may not seem super fast, when you are only 22 feet away from the pitching machine in the PowerAlley cage, 40 MPH seems like 80 MPH compared to a pitcher being the regulation 53 feet away. 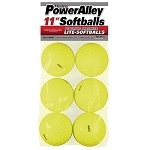 The PowerAlley 11" softball pitching machine can throw real softballs or dimple balls. 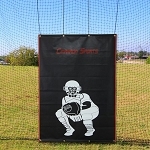 It's not only great for hitting, but can be used for fielding practice, throwing towering pop-ups, fly balls and grounders. 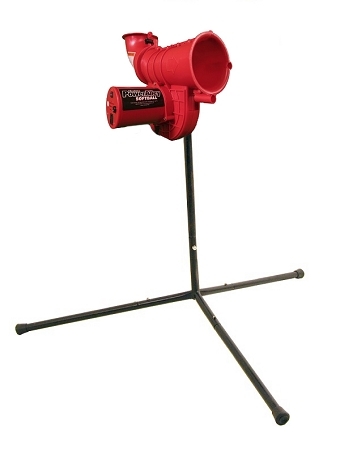 The quality design of the PowerAlley Softball Pitching Machine makes it durable and adaptable. This pitching machine s legs are built of tubular steel and are made to last. A fully enclosed wheel means maximum safety for you and those around you. 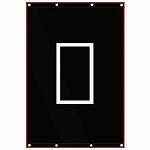 It can plug into an outlet using the included A/C adapter and mounted to the PowerAlley Home Batting Cage with the included mounting harness. Please Note: PowerAlley 11" Softball pitching machines DO NOT have a compatible ball feeder. Therefore, pitches must be fed into the machine one at a time, making solo training impossible. Use the PowerAlley Batting Cage along with the PowerAlley 11-inch Softball Pitching Machine to make a training center wherever you want! The PowerAlley batting cage comes with user friendly instructions and sets up in minutes. It is 22 feet long, 12 feet wide and 8 feet high - perfect for honing your skills without taking up a huge amount of space on the lawn! Heater Sports offers a 30 day money-back guarantee and a one year warranty to ensure your satisfaction, however, we re confident you will not have to use it. To ensure your satisfaction, the Heater Softball pitching machine and PowerAlley batting cage includes a 30 Day Money Back Guarantee. Both your pitching machine and batting cage are also backed by a Full 1 Year Warranty that includes repair, replacement and labor. No matter where you order a PowerAlley 11 Inch Softball Pitching Machine & PowerAlley 22 ft. batting cage package from, NOBODY actually stocks them; they all ship directly from the manufacturer's warehouse located in St. George, Utah. Therefore, the shipping time frame is exactly the same no matter what website you order from (we hope that it is this one!). PowerAlley 11" Softball & PowerAlley Cage combo packages typically take 2-4 business days to ship from the time you place your order. They ship via Federal Express (FedEx) Ground and could take anywhere from a day or two to a week to get to you AFTER being shipped, depending on your proximity to their warehouse. We will notify you of your tracking number the moment we receive it from the manufacturer's warehouse. Click here to download an easy to read, printable PDF of the PowerAlley Batting Cage Owner's Manual. Sorry, but there is not an online Owner's Manual available for the PowerAlley 11" Inch Softball Pitching Machine at this time.